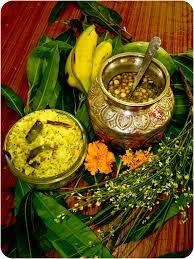 Ugadi is an important festival for people from Karnataka, Andhra Pradesh and Telangana. It is the New Year according to the Hindu calendar. The first month of the year is called Chaitra and Ugadi is the first day of Chaitra. The festival is called Gudi Padwa in Maharashtra. The festival usually falls in March or April. This year, the festival is on April 8 which is Friday. The pratipada tithi begins on April 7 at 4:53 PM and ends on April 8 at 1:05 PM. The festival is celebrated with much fervour and people usually clean their houses, buy new clothes and on the day of Ugadi and put torans of raw mango leaves on their doors. They also take a bath at dawn and apply hair oil. They also make a dish called Ugadi Pachadi which is prepared this day with ingredients like raw mango, neem, tamarind and jaggery. The celebrations end in the evening when people gather to listen to the religious panchangam or alamanac of the New Year.